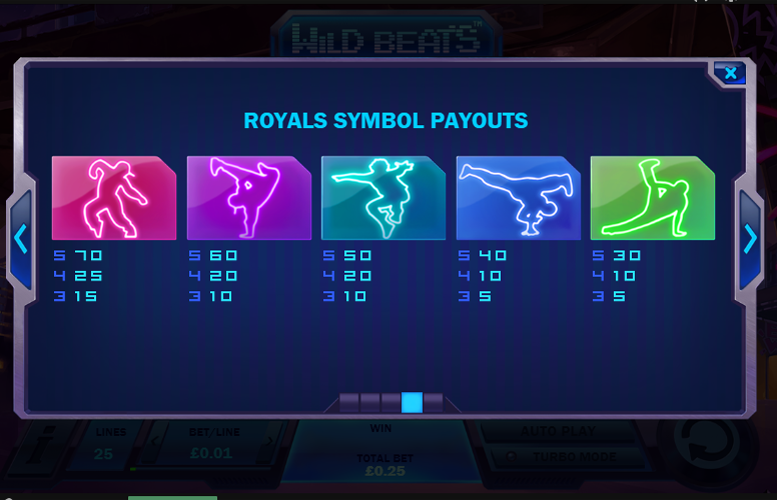 The Wild Beats slot machine from Playtech is the first break dancing themed game we’ve come across. It looks like it might be a winner too from the initial visual cues. It features a stylish gameboard with an ultra-modern finish and nicely designed symbols. However, dig a little deeper and it quickly becomes apparent that this game is seriously lacking in the gameplay features department. There isn’t a free spins mode and the one bonus that it does have will quickly get boring. Unfortunately, the criticism doesn’t end there. 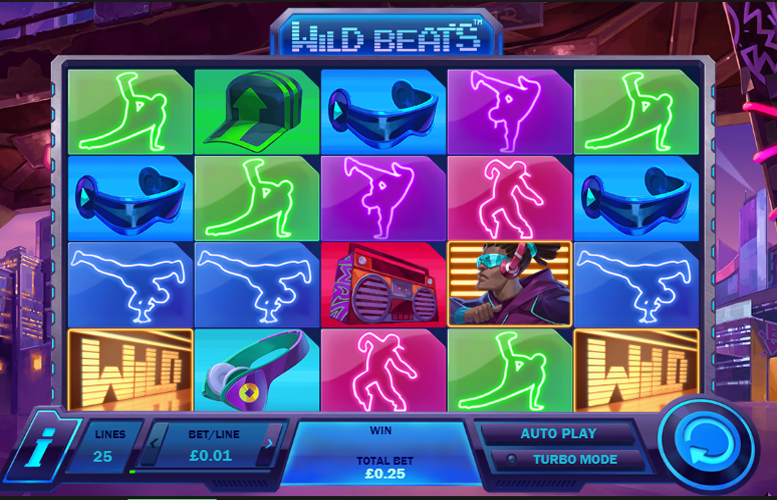 Wild Beats only lets players bet £10 per spin on it. This will discourage all but the low ballers around. Try harder, Playtech! Great artwork and atmosphere. 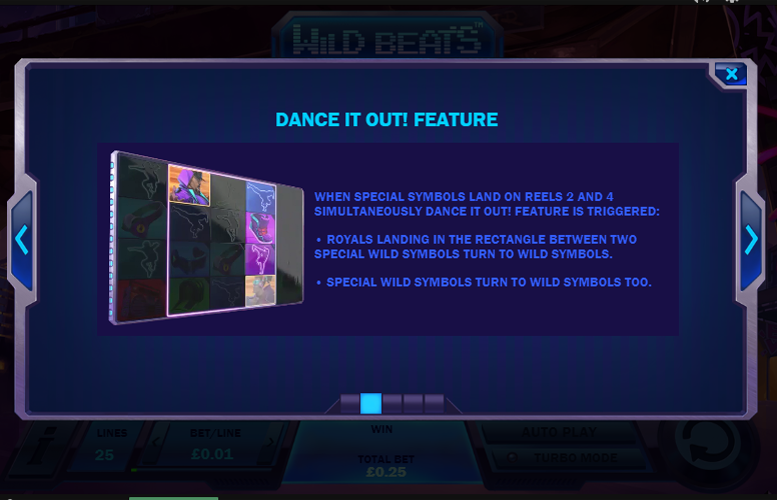 The Wild Beats slot has a modern feel that complements the theme well. Solid theme. We’ve not seen a break dancing slot machine before now. It’s a shame that this one is so lacking in almost every other capacity. Incredibly limited gameplay features. With just one bonus mode and no second screen games or free spins, even the biggest fans of break dancing culture will get bored of this one very quickly. Tragically low upper betting limit. The £10 maximum wager amount seems bizarre and will discourage many from trying Wild Beats. “Wild” = 5,000x the line bet. Boombox = 500x the line bet. Sneaker = 300x the line bet. Headphone = 200x the line bet. Visor = 180x the line bet. Cap = 160x the line bet. 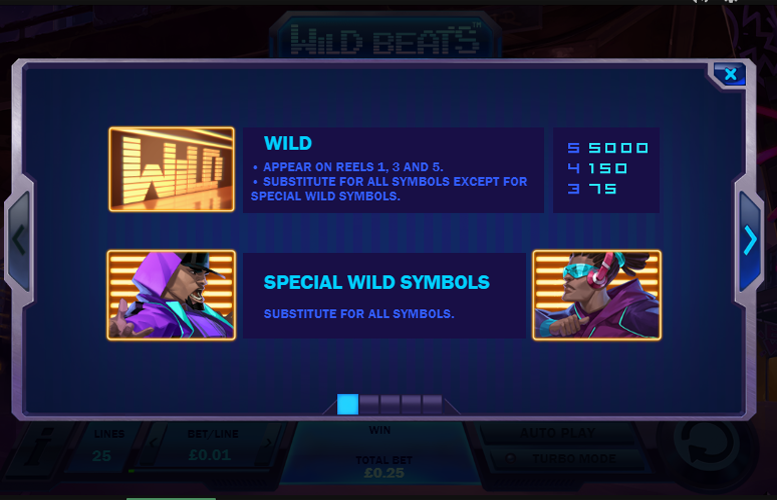 The Wild Beats slot machine features two special symbols. These are opposing break dancers. They trigger the Dance It Out! feature and are also “wild”. If players land both special break dancing symbols on reels two and four simultaneously, they’ll trigger the Dance It Out! feature. All the regular value symbols between the two dancers (on reels two, three, and four) automatically transform into “wild” symbols. This can make for some huge wins. What’s more, special “wild” symbols will also transform into “wilds” too. Pink = 70x the line bet. Purple = 60x the line bet. Turquoise = 50x the line bet. Blue = 40x the line bet. Green = 30x the line bet. 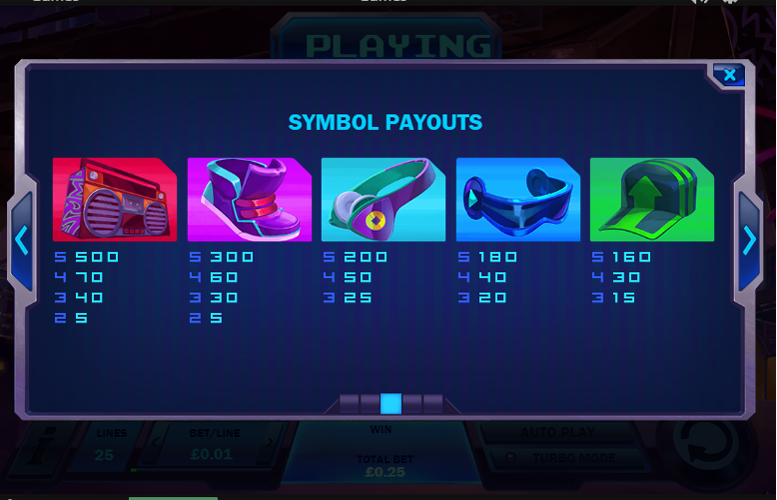 The number of win lines are fixed at 25 on the Wild Beats slot machine. This means that players are only able to adjust the amount bet per line. The minimum here is just 1p and the maximum is a totally uninspiring 40p. With the line bet set to the lowest, the smallest cost per spin is just 25p. Meanwhile, when set to the maximum, the upper betting limit is a tragically low £10 per spin. Whilst we’re used to slots not catering for the highest rollers around, this figure will likely put off most mid-stakes players too. Wild Beats looks like it could be a good game. It has a well-designed board and the symbols have a funky, modern art style to them. However, that’s where the praise must stop. The game has only one special feature and it’s not all that exciting. Then there’s the upper betting limit. Why on earth Playtech decided to further limit this game’s appeal by only allowing players to bet £10 per spin is utterly beyond us. Looks like we’re still waiting for a break dancing themed slot that we actually want to play. This game has a rating of 3 / 5 with 216 total reviews by the users.